Shield Used for protection against blows during combat. Made from wood or metal and held by a strap at the rear. 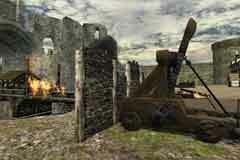 Siege The blockade of a castle or town to force the surrender of the occupants. Spingald War engine used for throwing large arrows. Similar to a ballista. 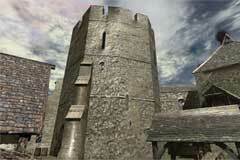 Explore all four floors of a Norman square keep similar to Dover Castle that was built in the twelfth century. 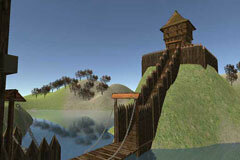 Explore a siege landscape and learn about the siege engines used to destroy a castle. 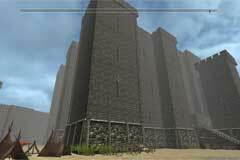 Explore a reconstruction of Stokesay Castle, a fortified manor house from the fifteenth century.